We’re in business to make life easier for those on the tools, and we do this by creating products and relationships that are built to last. We want our products to endure, and work hard throughout the entire duration of its life, so that’s how we build them. Continual development is part of our culture and we’re always looking at ways we can improve our product range and better our service to our customers. After working closely with a variety of users of our equipment, we have developed more products to assist in improving working efficiency. Some of these new products will be officially launched over the coming month, but we’re going to let you in to one of our secrets and give you a sneak preview! More detailed information will be available later in November in order to assist you in selling these new products, so keep your eyes peeled! Construction is now underway of the distinctive 45 storey residential tower in the London Docklands, named the Baltimore Tower. The design of the tower is unique; with the twisting glass. 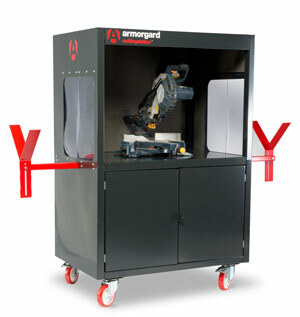 A new brand to lead the industry… …Armorgard, We’re leading the way with our new branding, so we trust you’re enjoying the ride! For many years now, we have set the benchmark with.